A few years ago I toured Taliesin West, Frank Lloyd Wright’s winter home and architecture school in Scottsdale, Arizona. 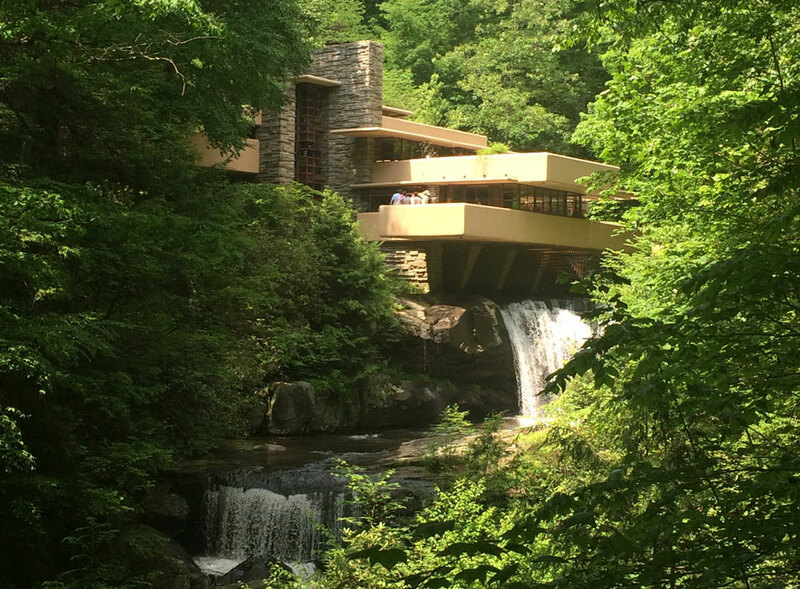 Then on a trip to the east coast I toured Fallingwater or the Kaufman Residence in Pennsylvania. Each of the buildings at Taliesin West and Fallingwater shared similar styles that include low ceilings, deep over hangs and corner windows to maximize natural lighting and control the temperature, elements that reflected the unique talent that was Frank Lloyd Wright. Wright is best known for his imprint on residential architecture, interior design, and furniture design. However, he started his career in Chicago after the Great Chicago Fire of 1871 working as a draftsman in a commercial architecture firm. The firm’s focus was rebuilding the commercial and public buildings that were destroyed by the fire. Any residential work was only done as a favor for important commercial clients. Wright focused on the firm’s major commissions by day and the firm’s residential work by night. Although Wright was compensated for his overtime, he was always short on funds. The financial pressures caused by his expensive life style lead him to accept his own commissions which violated his employment agreement. After being fired by Louis Sullivan, Wright started his own firm in 1893 where he focused on residential architecture. After designing over 1000 structures, 532 which were built, Frank Lloyd Wright is one of the best known American architects of all time. Although one the most acclaimed architects is known for his home designs, most architects focus on commercial or public buildings. Residential architecture is typically used to describe the design of single-family homes, renovations and remodels. Architects are licensed professionals who use art and science to design and build both residential and commercial structures. Although Wright declined an offer for a free formal architectural educations, today architects must complete an accredited bachelor or master’s level architecture program, serve as an intern to a licensed architect, and pass a national licensing examination. Residential architects differ from commercial architects in many ways. Residential architects use their skills specifically to design new homes, additions and renovations while commercial architects typically apply their skills to design larger projects such as office buildings, hospitals, sports stadiums and retail centers. Residential architecture firms are typically smaller because their projects tend to be smaller, requiring smaller project teams, and the detail and focus of the construction documents they produce is different as well. The contractors that build residential architecture projects are also different than those who build commercial projects. For single-family residential projects, the contractor is required to be licensed by the state of Minnesota to obtain a building permit. While it is the architect who needs to be licensed in order to obtain a building permit for commercial projects. The typical construction methods are also different. Residential architecture projects are typically wood framed, and the electrical and mechanical systems are designed by the subcontractors. Commercial projects are typically constructed with concrete, block and steel, with the electrical and mechanical systems designed by licensed engineers. Now that we have a better idea of what residential architecture is, how can we differentiate between the different types of residential architecture firms in Minneapolis? Minneapolis has a very active residential architecture market. You can see the work of residential architects on display in the Parade of Homes, the Luxury Home Tour, the Artisan Home Tour and the Homes by Architects tour. Midwest Home, Spaces and Architecture MN magazines also showcase the work of Minnesota residential architects. You can also surf the web or go to the American Institute of Architects’ firm directory to find information about architectural firms in Minneapolis. There are several different organizational models that describe residential architecture firms. Each has its own personality and their structure is usually designed around attracting their target market and how they deliver services to their clients. I would divide them into five main categories: the high-end firm, the style-centered firm, the status symbol firm, the partnership model and the sole practitioner. An architectural firm may exhibit several of these characteristics, but one of them will have priority in defining their organizational DNA. The high-end firm tends to be the stereotype most people think of when first considering architectural firms in Minneapolis. These firms usually limit their projects and clients to those who are doing large projects with a high level of design, a high level of finish and a high level of architectural service, which translates into high architectural fees for their clients. There is nothing wrong with this approach as long as you have the money to spend and desire the concierge service they provide. High-end firms typically are on the larger end of the spectrum and have very distinct staff roles. They will typically have a Project Designer (your main initial contact) who focuses on the design of your project. The Project Architect that will be responsible for overseeing the construction documents. The Project Architect may work with an architectural intern or draftsman that will help them produce the construction drawings. The style-centered firm is geared towards attracting clients that want to design a home in one specific style such as Modern, Cape Cod, Cottage, Craftsman, Colonial, Prairie Style or a style that is a unique expression of the specific residential architect. With this approach, the client selects the firm because they want something similar to what the firm has previously designed. They may not be looking for a home that is unique to them, but rather a common expression of the architect. The partnership model brings together multiple partners who each have a specific style they specialize in. It then funnels clients to the appropriate partner based on the style of home they are interested in. The partners share the costs of office space, support staff and advertising. This is typically the next biggest residential architecture firm after high-end. The sole practitioner may be the most popular type of residential architecture firm and may have the most variety. This firm typically consists of a single residential architect working one on one with each client to design their home. They may be style-centered or work in a variety of home styles, but the hallmark of sole practitioners is their personal relationship with each client. Fees, levels of service and design ability may vary greatly between individual architects. Therefore, it is important to do your homework in this group to make sure you are comparing apples to apples. The status-symbol firm invests in name recognition. Community events, speaking engagements, books, magazine articles and print advertisements keep their name in the public eye and ensure that you will receive the appropriate positive feedback when you mention the name of your residential architect to your circle of friends. Not that you won’t love the home they design for you, but it is just more important that you receive the validation of others than simply enjoying your new home in anonymity. Frank Lloyd Wright’s firm would have been a combination of all the above types of firms except for the partnership model. Wright didn’t play well with others unless he was in charge. Wright was high-end; he designed every detail of the home from the structure to the furnishings. Wright was style-centered; he imprinted his own unique style on every home he designed. Wright was a sole practitioner; he had underlings but he was the designer and decision maker. Wright was a status-symbol; at the height of his fame, the rich and famous wanted a Frank Lloyd Wright home even if it meant giving up their own style and the right to change anything in the home from that day forward. His fame was marked by his picture on the cover of Life magazine in 1938. No discussion of residential architecture would be complete without mentioning Frank Lloyd Wright in this, his 150th birthday year. Many would say that although Wright was a great architect, he was also a failure as a business and family man. While I would not like to emulate many of his professional and personal qualities, I do appreciate his design genius and the way he changed residential architecture forever. So, happy 150th birthday, Frank, and thank you for your visionary legacy for residential architecture! Don’t hesitate to call or message me if you’re interested in my architectural services or just want to learn more about residential architecture in general. I look forward to hearing from you soon!